A business has vowed to bounce back after one of its factories near the M1 in Derbyshire was engulfed by flames. 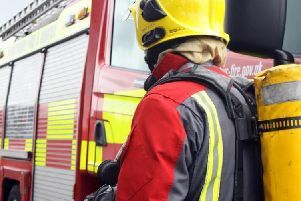 Investigations are ongoing to establish the cause of the major blaze at the Wanzl warehouse on Sawpit Lane, Tibshelf. The factory was ravaged by the fire, which sent a huge plume of smoke spiralling into the air and over the motorway. Firefighters from Alfreton, Bolsover, Shirebrook, Clay Cross, Mansfield and Ashfield were called to the blaze – next to junction 28 of the M1 – at about 3.30am on Tuesday. The factory fire at Tibshelf Services. Picture from Derbyshire fire service. Peter Matlby, station manager at Derbyshire fire service, said: “This was a serious incident which caused a lot of damage. A spokesman for Derbyshire fire service said the factory stored a “large amount of plastic”. Two aerial ladder platforms were in attendance. It is not yet clear what sparked the fire but investigations are continuing to the cause. The southbound stretch of the motorway was closed between junctions 28 and 29 but later reopened. Tibshelf Services and Sawpit Lane were also closed. Eyewitnesses described the blaze as “huge”.